Like many night vision devices especially digital ones, the technology in thermal imaging devices like binoculars, scopes, goggles and monoculars has really advanced over the last few years. So what was up until quite recently only available to the military and law enforcement sectors is now not only available for civilians, but is becoming much more affordable as the technology spreads and more and more competition comes into the marketplace. As I am sure you already know, for hunting at night, thermal imaging is in many ways superior to standard night vision as it picks up and highlights body heat, which makes spotting your game so much easier. Very Compact & Lightweight Size: 6.0" x2"x 2"
According to FLIR, the Scout TK has a detectable range of 100 yards (91m), which is good. However, keep in mid that if you need to identify an animals horns for example, the actual distance may be a little nearer as just like standard NV, it also depends on a number of environmental factors. As well as having a tough rubber armor that is similar to that you will find on your hunting binoculars. The TK Scout has a IP-67 waterproof rating. This means that it is rated as being impervious to water at a depth of 1 meter for 30 minutes. So whilst I wouldn't suggest you go swimming with it, it will be fine even in the worst weather conditions. 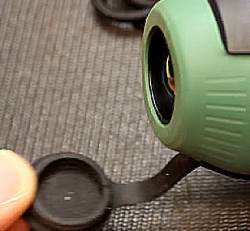 At the front of the device is rubber lens cover that is tethered to the instrument. Which is ideal, because looking for a lens cap that you dropped on the floor is the last thing you want to be doing in complete darkness! At the rear is a soft rubber eyecup and near the eye-piece is the small diopter adjuster that enables you to set the image to the correct distance to the viewfinder so as to get the sharpest view possible. On the top of the device are the main buttons as well as the USB port. This port is where you plug in the cable to charge the internal Li-Ion battery that lasts for around 5 hours of use. You also use the included USB cable to access any of the images and video that you may have recorded and which are stored on the camera's internal storage. I have not yet been able to establish exactly how much storage there is, but I think it is just under 2GB. 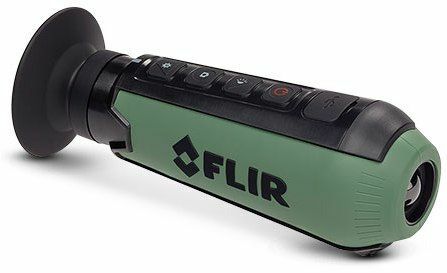 Whatever the case, FLIR say that it is good for about 1000 images or up tto4 hours of video footage. 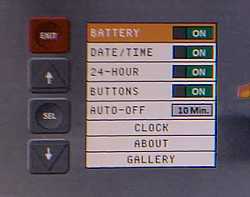 Pressing any of these buttons activates the menu that you can see on the LCD screen in the view finder. It is pretty self explanatory and really simple to navigate. The FLIR TK Scout Thermal Monocular comes with an impressive 9 different color palettes that are used to highlight the image in different ways depending on the conditions and what you are hunting for or looking at. So by simply pressing the button you can access that section of the menu to change the colors that are applied to the image. Below are two examples that are commonly used for hunting larger game, "White Hot" on the left where the warmest objects are white and is good for when there is low or high contrast between the target and the background. On the right is what FLIR calls "Graded Fire 1" and is where the warmest objects are colored very brightly against a grey background.